There were two early Martin families around Bronaugh. Andrew Jackson Martin and his wife Sarah were earliest settlers near what became Bronaugh. They had four sons and a daughter. Levi was the oldest. The other Martin children were Robert, born 1865; Peter, born 1868; Etta, born 1871; and John 1873. Levi was the oldest son of Andrew Jackson and Sarah Virginia Martin, who had brought him to Vernon County when he was just a small boy. The home of Mr. and Mrs. Levi T. Martin was among the first built in Bronaugh. During Bronaugh's early founding, Levi also used his team to help move buildings from the village of Zulu where he had been a pioneer resident, to the new town of Bronaugh. Levi had married Perletta "Pearl" McBride and they had three daughters, Lola, Flo and Goldie. Soon after the town of Bronaugh was founded, the residents experienced their first disease epidemic. Measles swept through the new town and the Levi Martin family was one of those affected in December 1886. On January 30, 1902, Mrs. Perletta Martin died at the home of her parents, Mr. and Mrs. Isaac McBride near Nevada. She had been born in Illinois on February 13, 1863, so her death came at the age of 39. She had been suffering from consumption for several months. Rev. Hageler of Moundville preached her funeral. 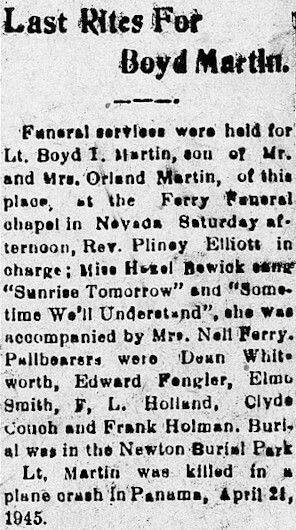 Burial was at Jewell Cemetery in Deerfield Township southwest of Nevada beside her infant daughter (Neva Bea Martin) who had died in 1900. Levi lived a long life in Bronaugh until his death August 24, 1944. Although Levi Martin was a reputable citizen of Bronaugh, by 1901, a couple of his brothers were gaining reputations as trouble makers. For example, a dance was being held in Bronaugh one Wednesday night in July 1901. During the dance, a disturbance was heard in a room directly under the dance hall. Floor Manager Mogle went downstairs to try to quiet down the men creating the noise. While he was talking to one of them, John Martin had allegedly struck Mogle with a bottle cutting him across the nose and under the eye. Drs. Holmes and Donovan were called and they dressed the wounds. It required eight stitches. John's brother was in trouble just a couple months later. One Saturday night in September 1901, Robert Martin walked into the L. H. Skaggs store on Bronaugh's Main Street. Martin was apparently intoxicated. Charles Hartzfeld came into the store a short time later. He walked up to Martin, spoke and put his hand on Martin's shoulder. Martin remarked that "he could lick any Dutchman on earth" and to everyone's horror, he pulled a knife. The knife was an ordinary pocketknife but before anyone could do anything, Martin had stabbed Hartzfeld in the chest below the heart. He also was cut from his elbow to wrist. Drs. Donovan and Holmes were called and they dressed Hartzfeld's wounds. In the meantime, Martin fled the scene and headed south. About noon the next day, Bronaugh's Constable, Tom Webb, arrived in Bronaugh with his prisoner. Martin had been tracked to Joplin and arrested there. A warrant was issued by Squire Barton charging Martin with intent to kill. Martin was then taken to the county jail in Nevada. A reporter from Nevada soon interviewed him. Martin said the cutting was an accident but he knew that "bad whiskey" caused him to get in trouble. His father paid his bail. His trial was held a month later and Robert Martin was assessed a punishment of three months in jail and $100 for the stabbing of Charles Hartzfeld. Andrew Jackson Martin died November 3, 1903 of kidney trouble. He was 68 years old and was buried at a cemetery referred to as Beard graveyard (more commonly known today as Jewell Cemetery). Etta Martin married A. L. Lacefield and they lived in the Joplin area where he was a miner. Their children were Oakie, b. about 1889; Lula, b. about 1890; and Dona , born about 1893. Etta died in August 1965 in Joplin at the age of 95. Sons Robert and John continued to live near Bronaugh. Robert apparently did not marry and cared for his elderly mother. John B. Martin married Lily Mae McBride, a sister of Levi Martin's wife Perletta. John B. died in 1966 and is buried at Worsley Cemetery, Bronaugh. Judge W. B. Martin, 1843 - 1930. 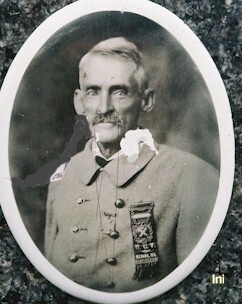 He is pictured here in his Confederate Greys. One of best known and most successful Bronaugh residents was William Beckley Martin who lived west of town in Harrison Township. He was a long time Vernon County judge and was quite active in Confederate activities. W. B. Martin and his wife, Martha A. Fitzgerald, were the parents of eight children - 7 sons and a daughter. The sons included William Beckley Martin Jr. (1870 - 1938); Garret R. Martin, born 1874; Clarence A. Martin, 1876 - 1901; Wade H. Martin, born 1878; James M. Martin, born 1881; Ebert Martin, born 1883, died as infant; Charles Ray Martin, 1892 - 1984. Daughter Mamie was born in 1890. Clarence Martin, son of Judge W. B. Martin, who lived west of Bronaugh in Harrison Township died in November 1901. Clarence had completed Law School at the University of Missouri but soon became ill. In July 1901, his parents had encouraged Clarence to stay in Colorado in hopes that the climate would help his condition (consumption). However, he grew worse, so he came back to Bronaugh where his parents and local doctors did all they could. Clarence Martin was buried at Deepwood Cemetery on November 10, 1901. A large crowd attended the burial services. Martha Fitgerald Martin, wife of Judge W. B. Martin died in early March 1905. She had been suffering from "lung trouble." Like her son, Mrs. Martin had been sent to Colorado to see if the change in climate would be of benefit, but it did not help her either. She was age 53 and her husband, five sons and a daughter survived. Burial was held on a Sunday afternoon at Deepwood Cemetery. Judge W. B. Martin remarried on Sunday, October 27, 1907. His bride was Mrs. Louisa Denton of Nevada. 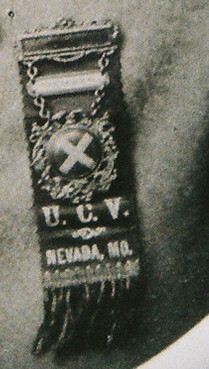 left: A close up of Judge Martin's United Confederate Veteran badge. William Beckley Martin, the eldest son of Judge Martin, lived his entire life around Bronaugh . He married Edwina Harrison in 1892. They were the parents of five sons and two daughters. 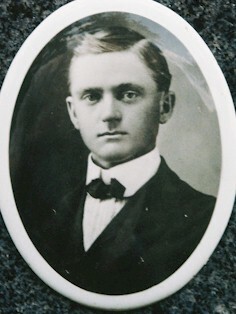 Their sons were Raymond, 1893-1977; Orland, 1874-1978; John Ewell 1895-1988; Edwin, born 1897; William, born 1909. The daughers were Emma, born 1900; and Glessner 1910 - 1970. W. B. Martin died April 3, 1938 and the State Insane Asylym Number 3 in Nevada. He and his wife are buried at Worsley Cemetery. 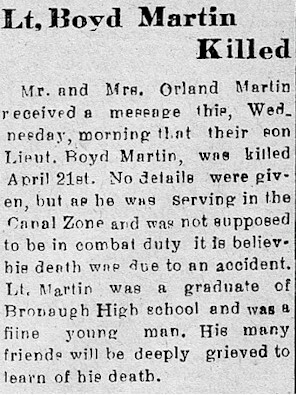 Orland Martin was a successful Bronaugh area farmer. He and his wife Pearl Copeland, were the parents of one son, Boyd Martin, who was killed in World War II. Having no direct heirs, after the deaths of Orland and Pearl, much of their estate was bequeathed to Bronaugh School for a new Library. The library is called the Martin Library. James M. Martin, son of Judge W. B. Martin. His was one of the biggest weddings of that day. It was held on April 25, 1905. The wedding was held at the Moundville home of Mr. and Mrs. J. T. Welborn. The bride was their daughter Ida Belle. James and Ida were the parents of three children: Clarence Martin, 1906-1993, (who married Caroline "Lena" Post); Annabel Louise Martin, 1917-2002; and Joseph LeRoy Martin, 1921-2004. The family lived in Vernon County, Missouri until at least 1920 but by 1925, they had moved to nearby Franklin, Bourbon County, Kansas. Ida Welborn Martin died in 1965 and James Martin died in 1975. They are buried in Deepwood Cemetery, Nevada.